Can Godolphin Cap Off Huge Spring With Mackinnon Favourite Blair House? News > Feature Race > Can Godolphin Cap Off Huge Spring With Mackinnon Favourite Blair House? It’s been a big month for the Blue Army, and it could be about to get even bigger. Thanks to a gun run from Cross Counter, Godolphin captured their first ever Melbourne Cup on Tuesday after three decades of defeat. In the weeks prior, Best Solution tasted success in the Caulfield Cup, and today, the overseas powerhouse has a host of chances running at Flemington in both features. Blair House, who ran second behind Benbatl in the Caulfield Stakes last start, enters as the $2.00 favourite for the Mackinnon Stakes (2000m). The Irish raider is third-up after a lightly raced prep this Spring, and trainer Charlie Appleby seems to think the six-year old is locked and loaded for a win. “Blair House is going to tomorrow’s Mackinnon in great form, last start was a phenomenal run behind Benbatl in the Caulfield Stakes” Appleby said on Friday. Blair House has drawn barrier two ahead of the $2 million Group 1, and will see Norwegian jockey William Buick take the ride today. Appleby admits his international hopeful was always on a path for this historic race, and is hoping the four week break between races works well. “He’s had four weeks between runs, and often fresh legs are the most effective at the end of this week,” Appleby said. 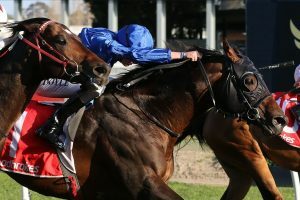 As for Godolphin’s other hopefuls, James Cummings trained Kementari remains the second-elect behind Redzel in the VRC Sprint Classic (1200m), but both runners will need to be mindful of Appleby’s hopeful, Jungle Cat. Jungle Cat, above, is one of two Godolphin hopefuls in today’s VRC Sprint Classic. Photo Credit: Steve Hart. “We’re very happy with Jungle Cat, the way he’s freshened up from his last run in the Toorak” Appleby said. Jungle Cat, who had won four straight prior to his disappointing run in the Toorak Handicap last month, remains on the third line of betting with Ladbrokes.com.au at $16.00. Full Mackinnon Stakes Odds can be seen below.